Marc R. Major was a teacher and mentor in Colorado and California. He is now a consultant and trainer with Clearwater Strategy, LLC. Chapter 2 Who Are Your Students? Major's book is an exceptionally well written, easy to follow guide with wonderful narrative and research and solid advice that teachers need without qualification. It is motivating and positive, with lots of examples and lots of help for the first year teacher in particular. 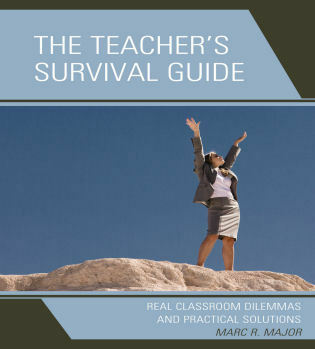 It includes excellent chapters on the critical subject of classroom management, with many recommendations for things teachers need to know and practice so they can get through the classroom management hurdles of the first few years and see the beauty of teaching...In fact, anyone in public education who avails himself or herself of Major's practical advice will automatically become a better teacher. An awesome achievement. Indeed the ideals of mutual respect and care central to Major's definition of positive classroom culture recur thematically throughout Classroom Dilemmas and Practical Solutions. Chapters and sub-chapters on teacher-parent, teacher-administrator, and teacher-staff interactions are imbued with real-world examples and suggestions that emphasize the significance of communication, understanding, and patience in the teaching enterprise. Ultimately, Major reminds us of the need to constantly evaluate the quality of all human relationships within the schooling context; a need that is common to all teachers. What strikes me about the book is the author's ability to weave pedagogy and practicality into an accessible text. The narrative and real-life examples via an anecdotal lens present a balanced picture of the realities—including the risks and pitfalls—-associated not only with the new teacher, but with seasoned teachers as well. [This is] a great book...[The author has] provided a comprehensive guide to teaching that's heavy on compassion. I'm confident that teachers and their students will greatly benefit from the thoughtful pieces on tolerance and bullying. Every classroom teacher should read it. Inspiring, refreshing, sparkling and practical! New and veteran teachers alike, and others who read Marc Major's book will recognize that creating and managing a classroom culture conducive to student success is paramount in preventing and minimizing disruptions. It is a refreshing alternative to traditional texts. It sparkles with reader-friendly, researched-based and thought-provoking ideas; sprinkled throughout are meaningful charts, graphs, and illustrations. True to its title, this book depicts exemplary and real dilemmas and solutions for solving management issues. Readers will gain a multitude of practical ideas. This book is unique in that it can be picked up, thumbed through, and used as a quick reference. This is due in part to incredibly well-planned organization of the material and smart layout. The book strikes an amazing balance between quick guide and literary read. Both the practical and philosophical aspects of teaching are presented with intelligence, wit, and calm wisdom and are then expounded on in a useful manner. Anyone in education would find it simultaneously refreshing, familiar and applicable. One of the first books I've encountered that offers realistic dilemmas faced by not only new but veteran teachers, and then offers solutions that are just as realistic... It illustrates the wide range of issues a new teacher must face. But it also leaves them with hope that the issues are not insurmountable. The book is organized in such a way that it is almost a step by step plan to help teachers create a good learning environment. Throughout the entire book, the author provides different resources and easy-to-follow suggestions. Overall, the book is a useful and creative resource to be kept at hand by novice practitioners that are starting to walk the path of a teaching career.If we were all able to do what this book set forward, then our classrooms would always be places where to feel excited and satisfied with the work we do. And for new and veteran teachers alike, this is certainly a great reward. Based on extensive research as well as the author's own teaching and mentoring experience, this lively book covers best practices in the essentials of teaching-from organizational tips to proven pedagogic and classroom management techniques. It combines insights from some of the most respected psychologists and educational thinkers with hundreds of firsthand discussions. In style, the book combines the intellectual rigor of a college textbook with the readability, practical relevance, and appropriate humor common to bestselling how-to manuals. While avoiding oversimplification, the author has distilled this vast reservoir of expert wisdom into an easily-digestible guidebook packed with diagrams, interviews, anecdotes, and case studies. The result is both enlightening and enjoyable to read.